Osmorhiza berteroi Hook. & Arn. The distribution of this small, woodland herb is centered in the forested regions of western North America. 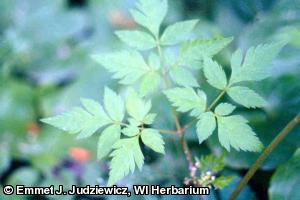 Osmorhiza berteroi has secondary population centers in eastern North America and temperate South America, hence its common name, Chilean sweet cicely. This species was first collected in Minnesota in 1870 by J. C. Jones near Hovland in Cook County, but was not seen again until 1978 when it was relocated near the original collection site. Subsequent searches have documented only a handful of additional sites in the vicinity, all with small populations in old-growth northern hardwood forests. These forests are isolated on a narrow ridge that parallels the north shore of Lake Superior from Duluth to the Canadian border. While this covers a distance of 240 km (149 mi. ), only a small portion harbors O. berteroi. Forests of this type are rare and in increasing demand for a variety of uses. The ecological integrity of these forests is also threatened by intensive recreational use and residential developments. For these reasons, O. berteroi was listed as an endangered species in Minnesota in 1984. Osmorhiza berteroi can be distinguished from the common O. claytonii (Clayton's sweet cicely) and O. longistylis (aniseroot) by the absence of involucels subtending the rays of the umbels. However, distinguishing O. berteroi from the equally rare O. depauperata (blunt-fruited sweet cicely) is difficult and requires close examination of the mature fruit. In O. berteroi, the body of the fruit is long and narrow with a conical-shaped stylopodium that is higher than it is broad and with styles about 1 mm (0.04 in.) long. In O. depauperata, the fruit is shorter and proportionately wider with a depressed stylopodium that is broader than it is high and with styles about 0.5 mm (0.02 in.) long. Osmorhiza berteroi occurs in northern mesic hardwood forests dominated by Acer saccharum (sugar maple). It appears to prefer moist soil on gentle, south-facing slopes. In at least one location it is associated with small, wet-mesic swales. It occurs with typical species of this habitat type such as Rubus parviflorus (thimbleberry), Streptopus roseus (rose twistedstalk), and Viola pubescens (yellow violet). Osmorhiza berteroi is a short-lived perennial that is pollinated by small, flying insects. It reproduces only by seeds, which are dispersed in the fur of mammals. According to Constance and Shan (1948), the pattern of distribution indicates that the species originated in western North America and migrated south, via long-extinct migration routes, to Chile and Argentina as well as east through the Great Lakes region to eastern North America. The Minnesota populations are presumably relicts of such a migration route that once connected populations in eastern and western North America. This link no longer exists, and the midcontinent populations are now geographically isolated. The populations are also ecologically isolated, occurring only in hardwood forests associated with the shores of the upper Great Lakes. The climatic influence of the Great Lakes is well documented and probably explains why the species survives there. The best time to search for O. berteroi is June through mid-August. It is impossible to know how much of a population decline has actually occurred. But a significant decline in O. berteroi does seem likely given the documented decline in old-growth northern hardwood forests, which are its primary, if not its only, habitat in Minnesota. Ongoing threats include clear-cutting of northern hardwood forests, intensive recreational use, and residential development in these forests. Osmorhiza berteroi may be able to survive a minimal level of selected tree harvesting if harvesting operations are conducted during the winter, but it is critical that the tree canopy remain essentially intact if the habitat is to continue to support this rare species (U.S. Forest Service 2000). The Minnesota Biological Survey is in progress in northeastern Minnesota, raising the possibility that additional populations could be discovered. A portion of one O. berteroi population occurs within a state Scientific and Natural Area that is being managed to perpetuate this species and its habitat. Constance, L., and R. H. Shan. 1948. The genus Osmorhiza (Umbelliferae) a study in geographic affinities. University of California Publications in Botany 23:111-155. Marquis, R. J., and E. G. Voss. 1981. Distributions of some western North American plants disjunct in the Great Lakes region. The Michigan Botanist 20:53-82. U.S. Forest Service. 2000. Population viability assessment in forest plan revision. Questions for plant population viability assessment panel: Osmorhiza berteroi. United States Forest Service, Region 9, Duluth, Minnesota.